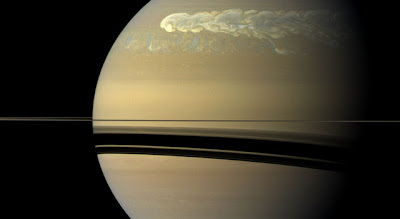 Maximizing Progress: Saturn's Superstorm ~ Gigantic Weather Pattern! The Daily Galaxy spots this ginormous superstorm on Saturn! "The storm encircles the planet -- whose circumference at these latitudes is 186,000 miles (300,000 kilometers). From north to south, it covers a distance of about 9,000 miles (15,000 kilometers), which is one-third of the way around the Earth. The storm encompasses an area of 1.5 billion square miles (4 billion square kilometers), or eight times the surface area of Earth. [...] The base of the clouds, where lightning is generated, is probably in the water cloud layer of Saturn's atmosphere. The storm clouds are likely made out of water ice covered by crystallized ammonia. [This is] the largest and most intense observed on Saturn by NASA’s Voyager or Cassini spacecraft."